Isolated enough not to be invaded by hordes of tourists, yet accessible enough to provide a living nature and relaxation, Bruny Island is a jewel of Tasmania. It is still preserved although its popularity with tourists, especially Australians, has exploded in recent years. And it’s no wonder! 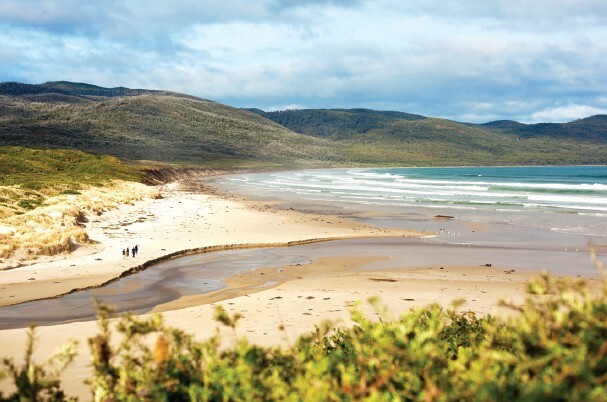 The island measures barely 50 km from north to south, but it is a concentration of the best that Tasmania has to offer. Large, deserted, beaches, a rugged coastline, beautiful hiking trails, a rich history as well as fauna and flora and abundant local products of high quality. We always bury our treasures. So, one must make a little effort and travel 200 km from the coast of mainland Australia to reach Hobart, the capital of Tasmania. The flights are very frequent from Melbourne (1h15 flight) and Sydney (1h50 flight). I chose to visit the small island with The Bruny Island Long Weekend, a travel company that promises tourists the discovery of Tasmanian natural beauty and wilderness, by walking and regaling with local products for three days. I cannot wait to sit down around a camp fire, a glass of wine in hand, enjoying a good plate of cheese and maybe a wallaby stew. It is towards the end of the austral summer, but this Friday, the sun is warm and makes the calm waters of the Hobart port sparkle. On the Elizabeth St Pier, a skipper and a hostess with eyes as blue as the sky, wait for me in front of a private catamaran. I am greeted on the boat by Robert Knight, alias Rob, who has organised the tour and will be my guide as well. We are only four to embark upon this one-hour cruise. We enjoy the beautiful view of the harbour and Mount Wellington, a 4,170 ft high peak that rises above the city like a green rocky shield of the bay. We sail to the entrance of D’Entrecasteaux Channel. Many places here evoke the memory of explorers who left their names in the history of Tasmania. Bruny Island has a rich history. Aborigines lived here until the arrival of European explorers, including Abel Tasman in 1642, Tobias Furneaux in 1773 and Captain James Cook in 1777. The rugged coastline of Bruny finally appears and we moor at Dennes Point, at the northern tip of the island. First good surprise, our arrival was greeted by the local inhabitants. Some dolphins sneaking around our boat! 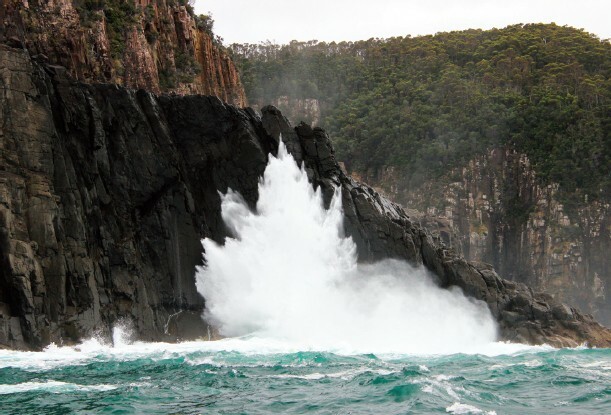 Bruny is perfect for wildlife watching: –Australian fur seals, penguins, whales, dolphins, kangaroos and wallabies (including very rare white wallabies). It is a paradise for bird lovers. Tasmania has 12 endemic bird species and all are found on Bruny. After this first encounter with the local wildlife, we climb into a minibus heading towards Cape Queen Elizabeth on a gravel road. Small modern farms or old ones made of corrugated iron add charm to the pastoral landscape. This is the beginning of our first hike of 12 km. We walk through a beautiful forest of gum trees opening onto a huge beach, which we are the only ones to tread upon. Climbing to the viewpoint where we will lunch, Rob shows nests of shearwaters and penguins burrows. The view over The Neck, an isthmus about 5 km long, which separates the North and the South of the island is amazing. On the other side of the cape, the waves crashing on the dark dolerite cliffs, a rock from the Neolithic period, a hundred meters below. After this fine introduction to the island, our little group stops at an oyster farm where the producer has left us some oysters to enjoy on the beach. The weekend looks very promising! Tasmania is known for its fresh produce and Bruny Island is a perfect illustration: farm pigs, sheep, olive groves, vineyards, oysters, cheese, orchards and even fudge production. I wonder how they gathered such a diversity of artisans on a small piece of land. Our culinary pilgrimage continues by visiting Bruny Island Cheese Company to sample its artisanal cheeses with strange names like “Holy”, the “1792” or the “O.D.O”. In the very modern boutique of the cheese factory, one can see the cheese ripening room; do a tasting and have a drink. Yes, how can anyone even consider a cheese tasting without a nice glass of wine? 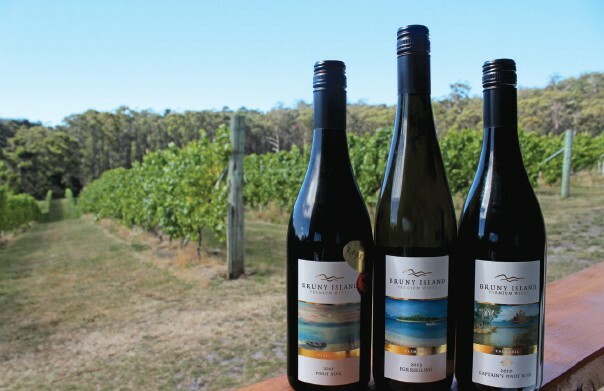 Rob had thought about it and brought us to a wine tasting of Bruny Island Premium Wines, the southernmost vineyard in Australia. On the way, I asked to stop at the viewpoint of The Neck, which for me is an icon of the island. After a rather breathless climb of several steps, the view is spectacular with the beautiful blue Adventure Bay on one side and Isthmus Bay on the other, separated by a very narrow strip of green land. We continue to Alonnah, the town of the island that offers more services, which is to say, a tiny police station, a post office and a pharmacy. No doubt, if you want to go on a shopping or partying vacation, Bruny Island is hardly your perfect destination! In the vineyard, we tasted eight wines – all very good – from Chardonnay to Riesling and Pinot Noir. We got to choose our favourite wines to accompany dinner tonight. After the vineyard, we reached our camp with my luxury tent in the middle of a eucalyptus forest. I immediately fell for the outdoor shower, a small wooden deck on the open forest. Rob’s fiancée, Bec, joined him to cook. I really felt like being at a dinner with friends, those who know how to cook like chefs! We ate around a long wooden table and a fire, in a small chalet with a terrace offering views of the forest. The dinner was excellent, prepared with the local products: wallaby carpaccio, mussels with saffron, barbecued lamb and blackberry panacotta. On my way to the tent, I heard noise of something heavy jumping across the forest. We were surrounded by wallabies! However, the thumping noise did not stop me from falling asleep quickly in my king-size bed, with a hot water bottle prepared by Bec lying underfoot. Even in summer in Tasmania nights are cold, it was around 10 degrees that night. The second day, we entered the South Bruny National Park heading towards Cloudy Bay, in the south-east of the island, with its beautiful beach on which we walked for three kilometers. From the beach, we climbed steadily through the dense vegetation to East Cloudy Head. We were lucky to see several eagles circling gracefully above us. The coast reveals a stunning array of colours, shades of green and blue separated by a large sandy cove. After a good lunch with this view, we visited the Cape Bruny Lighthouse, about half an hour away. It was not planned, but Rob accommodated my request as we had some spare time. It was nice to visit places “a la carte” rather than simply following a minutely planned visit. The dinner was also excellent with rillettes, seven different cheeses, fresh salmon and pork on a tortilla that was made by Rob and even the flour used in cooking came from an old mill still operating in Tasmania. I was not aware when I slipped into my sleep. The only marker for time that I had was the sun as the rays of the sun declined and shaved the tops of eucalyptus before disappearing by tinting the clouds gold and pink. On the third and final day, we gave our legs some exercise by walking a kilometre in the rainforest, which was dark and mysterious, as if from a book of Tolkien. Mossy trees, dense and tall vegetation, numerous endemic trees such as sassafras, myrtle trees, man ferns, blackwood, etc. There was also a small river flowing along the track. Birds of different varieties were tweeting in the forest and we ate berries directly from the trees, the “bush tucker” as the Aborigines would say. Then we went on to Adventure Bay, a name that makes you want to jump on a boat, with a parrot on the shoulder, shouting – “All aboard!” Our cruise with Pennicott Wilderness Journeys starts from the place where Captain Cook anchored on the island for the first time in 1777. Robert Pennicott is a tourism professional widely recognized for the quality of his tours and he had won the Tasmanian Tourism Award for Excellence in Sustainable Tourism for the last four years. 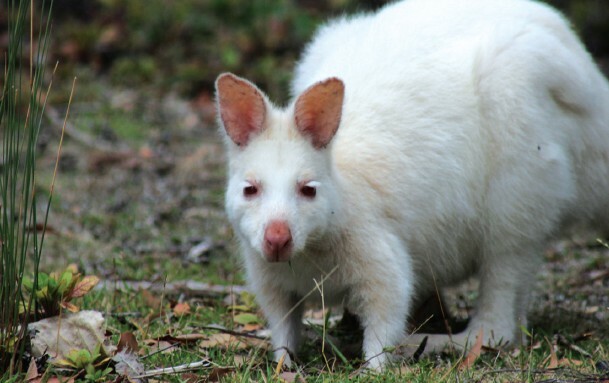 Just before boarding the boat, we went in search of the rare white wallabies and we were fortunate to see one just a few steps later. I was able to get close enough; they look like real stuffed animals, fluffy with long white eyelashes and a pink nose. 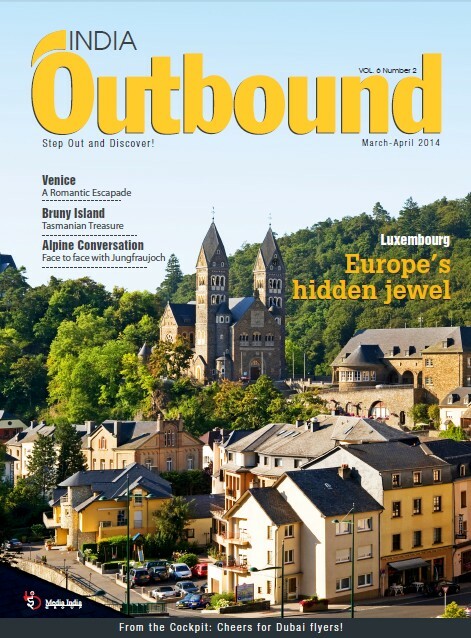 It was time to board our boat, equipped with powerful engines, and ferrying nearly 40 people. The tour gives a completely different view of the island as the South East Coast is really – wild. I felt we were not so far from the Antarctic for the first time as a glacial wind whipped my face and I watched waves several meters high crashing against the dolerite cliffs. It was breathtaking. The Skipper led us close to blowholes where the foam was sprayed over 130 feet high and splashed us. It felt like being on another island, a place where the environment is so hostile that no human being could survive. It was both beautiful and very impressive. The waves lifted our boats, taking it to a high cliff one moment and throwing it low in a trough the other. The rapid and volatile movement made all of us scream, with an equal share of panic and fun. Through all this, we also saw cormorants and majestic albatrosses flying around the boat and then we arrived at The Friars, a group of small islands with a colony of Australian fur seals. The sea was rough and the waves fell on us. I got up and I clung to the railing of the boat so as to not miss this exciting natural spectacle. On the return journey, a pod of a dozen dolphins approached the boat and followed us for a while. After three intense hours, full of surprises, sensations and memories recorded by our cameras, we met Rob at the pier. He took us for a delicious lunch to the Jetty Cafe near Dennes Point for the last leg of the journey — a much anticipated return to Hobart aboard a seaplane. From the terrace of Jetty Cafe, we could spot the little red and white airliner Tasmanian Seaplane Air Adventures turning in a circle around the beach before landing. We joined Ben, a friendly pilot, after having warmly thanked Rob for a great weekend. The flight to Hobart ran along the coast, allowing us to enjoy spectacular views of the Tasmanian Peninsula, the port of Hobart and the Tasman Bridge. I found the flight of 12 minutes too short. Just as my visit to Bruny Island during which I saw and did so many different things that I have trouble believing that the dream lasted only three days.